The Rosholt Fair was begun by action of the Rosholt Advancement Association at a meeting held on May 10th of 1921. At this meeting it was decided to hold a picnic in conjunction with the the Portage County Guernsey Breeders Association to be held on June 15th of that year. As this was a success it was further decided to make this “Fair” an annual event. The Fair became an Official Fair by action of the committee on July 11 of 1922 when it was decided to move the date of this event to Labor Day and be known as the “Rosholt Community Free Fair”. Receipts for this first Fair were $228.76 and expenses were $226.46 leaving a profit of $2.30. This profit was considered a “decided success”! 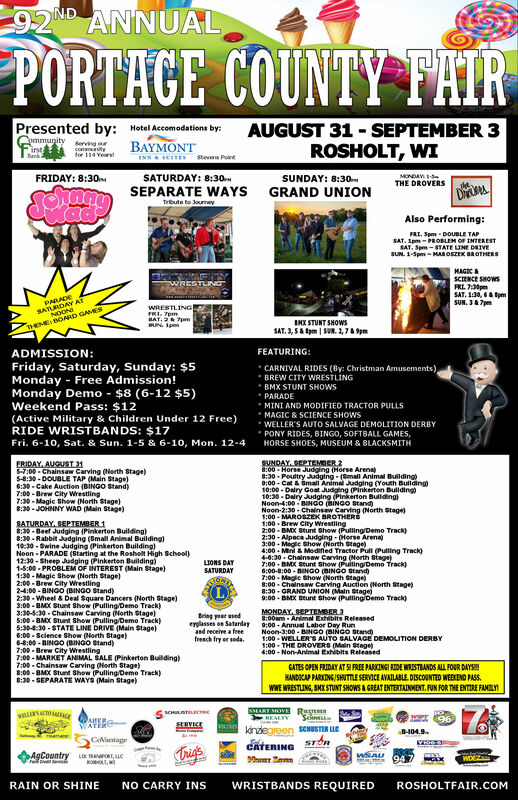 We are now known simply as the Rosholt Fair Association, Inc. and there is very little that is free any more, especially in light of State funding cuts. However, the $5 gate admission charged Friday through Sunday (with FREE parking) and Monday being FREE, is probably the least expensive of any Fair in the entire State. We’re kind of proud about that too.